Dan has a couple of Thomas Patrick boards, as well a quiver of boards by other shapers. Dan likes to experiment with different shapes, so last month he approached me about shaping a mini-longboard similar to the Bear Wombat, the Walden Compact Disk, the Greek Shorty or the Taka Scorpion. The idea of a mini-longboard is to have a board with longboard features, e.g. 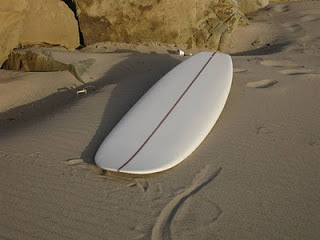 wide nose, wide tail, low rocker, etc, but in a length that will fit easily into a beachbreak. He and I spent a couple of weeks discussing this shape and identifying performance expectations. I sent him a couple of drawings and he gave me feedback on what he liked or didn’t like. This is the board we came up with. Dimensions: 6′ 10″ 17-13/4″ x 21-3/8″ x 15-1/2″ 2-3/4″. The bottom has a subtle single-concave in the front half that transitions to “V” in the tail with double-concaves feeding into the fin array. The board has a 2+1 fin configuration which allows the board to be surfed as a 2+1, a single-fin, or with the proper 4″ center fin, as a thruster. The board has a 3/8″ cedar stringer and with the clear, wet-sanded gloss finish, it projects a clean, classic look. sweet. how do I order one? Hey Reefy…I thought you would be standing on that T-Belly by now? ?